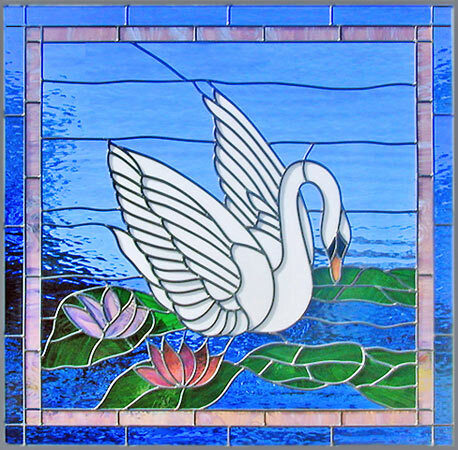 Swan 8 Blue Waterglass Leaded Stained Glass Window Custom Glass Design. "SWAN 8P" LEADED STAINED GLASS CUSTOM AT GLASS BY DESIGN. Custom stained and leaded glass swan window was 36" x 36". The price for this window custom made to your dimensions at this scale would be $225 per square foot. We adapted this elegant swan — a favorite for a bathroom window — one of a pair of swans on a sheet of giftwrap paper some 30 years ago. The size of this design can be altered by adjusting the background space and/or removing the border.